It wasn’t there a couple of months ago. The non-Japanese population density is rather high in this area, especially north-American and European, I guess they had some understanding issues. It’s not the way of doing things anyway, especially with their outspoken passion for 国際化 and theit willingness to open further the country to tourism. Who’s getting stuffed, and why? Are only NJ getting stuffed? What an upgrade! This new sign changes the wording very insignificantly and looks unwelcoming now to Chinese and Korean speakers as well. I’m not impressed, QB House. I don’t think this is quite as awful as it might look at first glance. At worst, it’s a sadly typical example of parochial “foreigners = trouble” thinking. There must have been at least one case of a foreigner with poor Japanese kicking up a stink because he/she didn’t get the haircut he/she wanted but was unable to describe, so QB decides to play it safe and preempt future such problems. A bit small-minded, perhaps, but not, in my opinion, malicious or racist. I remember an unfortunate experience I had in Saijo, a town half an hour’s journey on the train east of Hiroshima, in 1990, when I’d only been in Japan a few months and went for my first haircut at a mom ‘n’ pop joint. 「少しだけ」(“sukoshi dake,” or “just a little”) I said, putting my thumb a centimeter from my forefinger to indicate that I only wanted a trim. But the hairdresser misunderstood and thought I wanted a crewcut, which she proceeded to give me (it was too late to complain once the clippers had been quickly wielded). Did I kick up a stink? Of course not. It was funny–exasperating, but funny nevertheless. — You look good with a crewcut anyway, Mark. 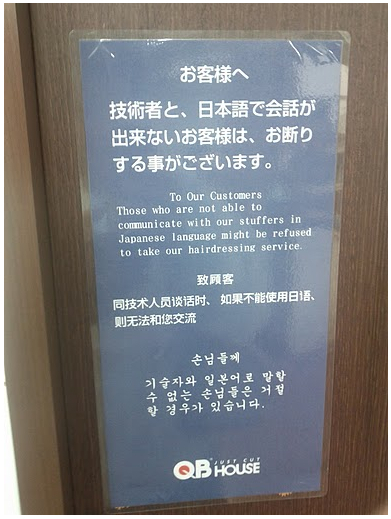 1) A complaint by a foreigner => have to take measures against all foreigners (who all speak English, of course, in the way the sign is rendered) by preparing to refusing them service with a signposted notice. 2) A complaint by a Japanese => QB House Tameike Sannou probably calls an in-house meeting to understand the problem, in an attempt to improve their service for the customers. No sign goes up saying “it’s your fault for not communicating with us properly, so we’re going to refuse you service if there’s any chance of that”. It the same logic employed by hotels that say, “we can’t speak any foreign languages, so we’ll refuse foreigners service”. It’s one step improved by allowing for the possibility of NJ speaking Japanese (i.e., it’s not a blanket refusal). But again, the onus is on the customer to be a good customer if the customer is NJ, not the typical onus of the shop doing hansei to be a good shop if the customer is Japanese. It’s not equal treatment. All jokes aside, the sign really didn’t change a thing. Its still refusal of service, just more vague. But hey, at least now its in Korean and Chinese(simplified?) instead of just English. ‘Cause obviously all foreigners speak english. Would it not be less combative, and hence more productive and successful, to just kindly offer to help them write acceptable signs? 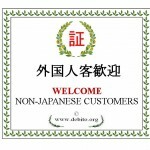 I write not as a Japanese or a Foreigner but as an ex-shop keeper and small business person. Managing a successful shop or a small business, running a night club, it is all the same; you need some kind of door policy. Unless you have managed a door onto the street, you have no idea of the problems that can walk in. — March right down to QB House Tameike Sannou and offer to help. Now I think the best is to send this photo to some major Chinese or/and Korean media…By the way, called the Customer Center 消費者センターand now they are checking the things. But if someone really has access and knows how to send the photo to some Chinese newspaper, lets do it. 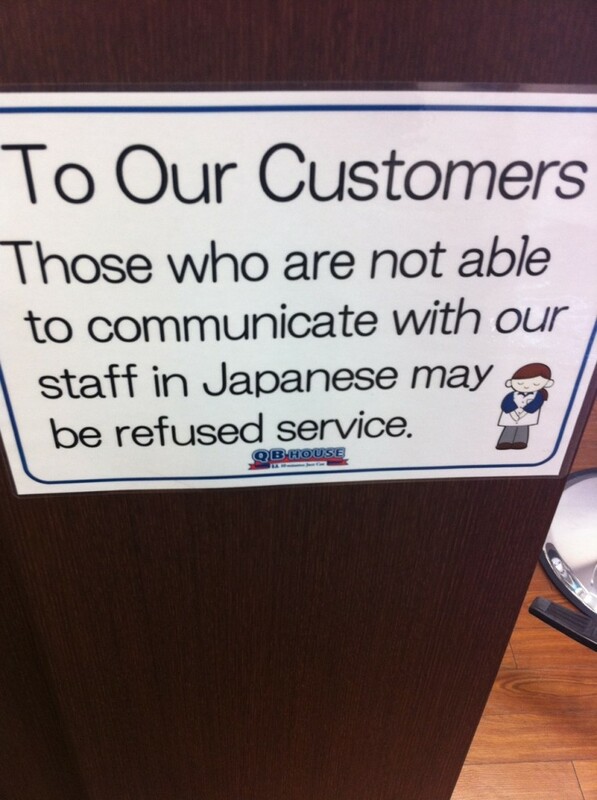 Well, I dunno…the Chinese version doesn’t say anything about refusal of service, just that if you can’t use Japanese they might not be able to communicate with you. Also, they used the really polite form of “you.” I don’t think it sounds as terse and rude as the English version does. On a related note, Fukui City says you can’t live in their public housing unless you understand Japanese. This may be more important than the haircut issue. HONOLULU — A restaurant has attracted the attention of the Hawaii Civil Rights Commission with a notice that it will add a 15 percent gratuity to the checks of patrons who don’t speak English. The warning is in fine print on the menu at Keoni by Keo’s. The menu also says parties of six or more will be charged the same amount. The Waikiki restaurant told KITV that its customer base includes many international travelers who, by custom, do not tip. The restaurant says it’s merely trying to help its customers and wait staff. About 17 percent of the nearly 7 million tourists who visited Hawaii last year were from Japan, where people do not leave tips in restaurants. IRS administrative rules require the restaurant to consider 8 percent of its total sales as tips, so waiters must pay taxes accordingly, even on tips they often do not receive, a representative of Keoni by Keo’s told KITV. Bill Hoshijo, executive director of the Civil Rights Commission, didn’t speak specifically about the restaurant, but said language referring to non-English speaking customers could be a problem. 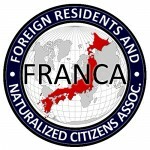 “Discrimination based on language is ancestry discrimination,” Hoshijo said. The commission hasn’t received complaints about the charge, but Hoshijo said the commission will likely send a letter to the restaurant inquiring about the practice and will likely investigate the practice at other restaurants. “Places of public accommodation can come up with different ways to address those concerns that are non-discriminatory,” Hoshijo said. Keoni by Keo’s said the gratuity charge is printed in red on the customer’s check and is explained when the customer pays at the register. The restaurant said if the customer does not want to pay the gratuity, then they simply don’t. Bryce Richards, a visitor from Mile City, Mont., disagreed with the charge. “I don’t think it’s fair. I think with a mixed culture we’ve got today, they should accommodate everybody,” Richards said. Angela Militello had some sympathy for the restaurant. “I don’t approve of it, but I see where they’re coming from. When you live off tips, when people don’t tip, it really hurts your own income,” said Militello, who was visiting Waikiki from Orlando, Fla.
I’m very late to this discussion, but I have to say I’ve been getting my hair cut at that Tameike shop for years, and the staff there has never been anything but professional and courteous. There are frequently other gaijin in there when I go. Nobody seems to be suffering any indignity, and the place serves up a reasonably sharp haircut in 10 minutes for ¥1,000. I saw that sign, gave it an amused chuckle, and forgot about it. I plan to keep going.